It's great being able to talk to an Amazon Echo speaker – that sci-fi sheen never wears off as you get your Alexa-powered, voice activated assistant to do your bidding with just a few words. But what if you can't remember the right words? Or, heaven forbid, you have a sore throat? Sometimes you need to rest those vocal chords, especially if you've got a complicated command that needs specific phrasing for Alexa to understand. If you've invested in Amazon's Echo Buttons, you've now got an alternative control method. Though the colorful buzzers were originally designed for Alexa-powered gaming, they've now been updated to be able to control smart home routines. So, what separates these from, say, just a regular light switch then? 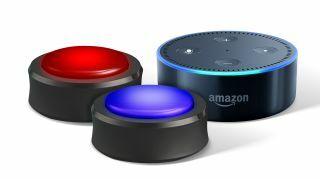 Not only can they be placed anywhere around a room that you like, but they can also be programmed within the Alexa app to control more than one gadget at once. Want your Hue bulbs to come on at the same time as your smart coffee brewer? Or all the smart locks in your home to slam shut at the same time? Program an Echo Button to do it and with a tap you're sorted. It's a nice way of breathing new life into the (somewhat wasted) Echo Buttons for those living in an Alexa world. And, if you're living with family or visitors that just can't get their heads around the thought of conversing with a machine, they've now got a tactile way to enjoy the benefits of a smart home too. At $19.99/£19.99 a pair, the new feature lands just in time to be partnered up with your Black Friday smart home purchases.